A family from South Texas has their car break down between Austin and Dallas as they travel seeking work in 1936. Courtesy of the Library of Congress. Historians have noted that the state’s economic collapse was not as severe as that which struck the industrialized states. 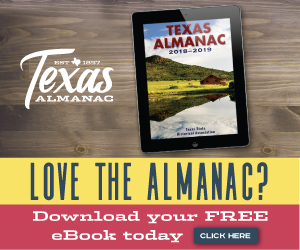 Texas’ economy had sputtered through the decade of the 1920s, primarily because of the fluctuation of the price of cotton and other agricultural products. But agricultural prices were improving toward the end of the decade. The Fergusons attempted a political comeback in the gubernatorial election of 1930. But Texans elected Ross S. Sterling, the founder of Humble Oil Co. Early in the Depression, Texans remained optimistic that the economic problems were temporary, another of the cyclical downturns the nation experienced periodically. Indeed, some Texans even felt that the hardships would be beneficial, ridding the economy of speculators and poor businessmen. Those attitudes gave way to increasing concern as the poor business conditions dragged on. A piece of good luck turned into a near economic disaster for the state in late 1930. C.M. “Dad” Joiner struck oil near Kilgore, and soon the East Texas oil boom was in full swing. Millions of barrrels of new oil flooded the market, making producers and small landowners wealthy. Soon the glut of new oil drove market prices down from $1.10 a barrel in 1930 to 10 cents in 1931. Many wells had to be shut in around the state because they could not produce oil profitably at the low prices. The Texas Railroad Commission attempted in the spring of 1931 to control production through proration, which assigned production quotas to each well (called the allowable). The first proration order limited each well to about 1,000 barrels a day of production. Proration had two goals: to protect reserves through conservation and to maintain prices by limiting production. But, on July 28, a federal court ruled that proration was an illegal attempt to fix prices. In August 1931, Gov. Sterling placed four counties of the East Texas field under martial law and briefly shut down oil production there altogether. A federal court later ruled the governor’s actions illegal. Gov. Sterling was roundly criticized for sending troops. Opponents said the action was taken to aid the major oil companies to the disadvantage of independent producers. In 1932, Gov. Sterling appointed Ernest O. Thompson to a vacancy on the railroad commission. Thompson, who had led a coalition in favor of output regulation, is credited with fashioning a compromise between independents and major oil companies. In April 1933, the railroad commission prorated production on the basis, in part, of bottom-hole pressure in each well, and the courts upheld this approach. But enforcement remained a problem. Finally in 1935, Texas’ Sen. Tom Connally authored the Hot Oil Act, which involved the federal government in regulation by prohibiting oil produced in violation of state law from being sold in interstate commerce. Thereafter, Texas’ producers accepted the concept of proration. Since Texas was the nation’s largest oil producer, the railroad commission could set the national price of oil through proration for several decades thereafter. Despite these problems, the oil boom helped East Texas weather the Depression better than other parts of the state. Farmers were hit particularly hard in 1931. Bumper crops had produced the familiar reduction in prices. Cotton dropped from 18 cents per pound in 1928 to six cents in 1931. That year Louisiana Gov. Huey Long proposed a ban on growing cotton in 1932 to eliminate the surplus. The Louisiana legislature enacted the ban, but Texas was the key state to the plan since it led the nation in cotton production. Gov. Sterling was cool to the idea, but responded to public support of it by calling a special session of the Legislature. The lawmakers passed a cotton acreage limitation bill in 1931, but the law was declared unconstitutional the following year. One feature of the Depression had become the number of transients drifting from city to city looking for work. Local governments and private agencies tried to provide relief for the unemployed, but the effort was soon overwhelmed by the number of persons needing help. In Houston, blacks and Mexican-Texans were warned not to apply for relief because there was not enough money to take care of whites, and many Mexicans returned to Mexico voluntarily and otherwise. To relieve the local governments, Gov. Sterling proposed a bond program to repay counties for highways they had built and to start a public-works program. Texans’ long-held faith in self-reliance and rugged individualism was put to a severe test. By 1932, many were looking to the federal government to provide relief from the effects of the Depression. U.S. Speaker of the House John Nance Garner of Texas was a presidential candidate when the Democrats held their national convention. To avoid a deadlocked convention, Garner maneuvered the Texans to change strategy. On the fourth ballot, the Texas delegation voted for the eventual nominee, New York Gov. Franklin D. Roosevelt. Garner got the second place on the ticket that swept into office in the general election. In Texas, Miriam Ferguson was successful in unseating Gov. Sterling in the Democratic primary, winning by about 4,000 votes. Her second administration was less turbulent than the first. State government costs were reduced, and voters approved $20 million in so-called “bread bonds” to help provide relief. In 1933, horse racing came to the state, authorized through a rider on an appropriations bill legalizing pari-mutuel betting. The law was repealed in 1937. Prohibition also was repealed in 1933, although much of Texas remained dry under the local-option laws and the prohibition against open saloons. State government faced a series of financial problems during Mrs. Ferguson’s second term. The annual deficit climbed to $14 million, and the state had to default on the interest payments on some bonds. Voters aggravated the situation by approving a $3,000 homestead exemption. Many property owners were losing their homes because they could not pay taxes. And while the exemption saved their homesteads, it worsened the state’s financial problems. Many Texas banks failed during the Depression, as did banks nationally. One of Roosevelt’s first actions was to declare a national bank holiday in 1933. Gov. Ferguson closed state banks at the same time, although she had to “assume” authority that was not in the law. In Washington, Texans played an important role in shaping Roosevelt’s New Deal. As vice president, Garner presided over the Senate and maneuvered legislation through the upper house. Texans also chaired major committees in the House: Sam Rayburn, Interstate and Foreign Commerce; Hatton W. Sumners, Judiciary; Fritz G. Lanham, Public Buildings and Grounds; J.J. Mansfield, Rivers and Harbors; and James P. Buchanan, Appropriations. With this influence, the Texas delegation supported the president’s early social programs. In addition, Jesse Jones of Houston served as director of the Reconstruction Finance Corporation, the Federal Loan Administration and as Secretary of Commerce. Jones was one of the most influential men in Washington and second only to Roosevelt in wielding financial power to effect recovery. Poor conservation practices had left many of the state’s farmlands open to erosion. During the Dust Bowl days of the early and mid-1930s, for example, the weather bureau in Amarillo reported 192 dust storms within a three-year period. Cooperation between state and federal agencies helped improve farmers’ conservation efforts and reduced the erosion problem by the end of the decade. Mrs. Ferguson did not seek re-election in 1934, and Attorney General James V. Allred was elected. Under his administration, several social-welfare programs were initiated, including old-age pensions, teachers’ retirement and worker’s compensation. Allred was re-elected in 1936. Some of the New Deal’s luster dimmed when the nation was struck by another recession in 1937. Although Texas’ economic condition improved toward the end of the decade, a full recovery was not realized until the beginning of World War II — when the state went through another industrial revolution. Tragedy struck the small East Texas town of New London in Rusk County on March 18, 1937. At 3:05 p.m., natural gas, which had seeped undetected into an enclosed area beneath a school building from a faulty pipe connection, exploded when a shop teacher turned on a sander. Approximately 298 of the 540 students and teachers in the school died, and all but 130 of the survivors were injured. The disaster prompted the Legislature to pass a law requiring that a malodorant be added to gas so leaks could be detected by smell. In 1938, voters elected one of the most colorful figures in the state’s political history to the governor’s office. W. Lee “Pappy” O’Daniel, a flour salesman and leader of a radio hillbilly band, came from nowhere to defeat a field of much better known candidates in the Democratic primary and to easily win the general election. When re-elected two years later, O’Daniel became the first candidate to poll more than one million votes in a Texas election. But O’Daniel’s skills of state did not equal his campaigning ability, and throughout his administration, the governor and the Legislature were in conflict. In early 1941, long-time U.S. Senator Morris Sheppard died, and O’Daniel wanted the office. He appointed Andrew Jackson Houston, Sam Houston’s aged son, to fill the vacancy. Houston died after only 24 days in office. O’Daniel won the special election for the post in a close race with a young congressman, Lyndon B. Johnson. Lt. Gov. Coke R. Stevenson succeeded O’Daniel as governor and brought a broad knowledge of government to the office. Stevenson was elected to two full terms. Thanks to frugal management and greatly increasing revenues during the war years, he left the state treasury with a surplus in 1947. Voters also solved the continuing deficit problem by approving a pay-as-you-go amendment to the constitution in 1942. It requires the state comptroller to certify that tax revenues will be available to support appropriations. Otherwise the money cannot be spent. As in every war after Texas entered the Union, young Texans flocked to military service when the United States entered World War II. More than 750,000 served, including 12,000 women in the auxiliary services. In December 1942, U.S. Secretary of the Navy Frank Knox said Texas contributed the largest percentage of its male population to the armed forces of any state. Thirty Texans won Congressional Medals of Honor in the fighting. Audie Murphy, a young farm boy from Farmersville, became one of the most decorated soldiers of the war. Dallas-born Sam Dealey was the most-decorated Navy man. Important contributions also were made at home. Texas was the site of 15 training posts, at which more than one and a quarter million men were trained, and of several prisoner-of-war camps. World War II irrevocably changed the face of Texas. During the decade of the 1940s, the state’s population switched from predominantly rural to 60 percent urban. The number of manufacturing workers almost doubled. And as had been the dream of Texas leaders for more than a century, the state began to attract new industries.